Some 43% of people say they hate having to put up with their other half's clutter. A study by Endsleigh found that when couples first move in together, women tend to despise the artwork their other half brings to the house, while men have more of an issue with the furniture. As we reported earlier this month, three quarters of people say they have some sort of relationship problem after moving house - while 87% of people moving in together for the first time will fall out. For couples moving together, the biggest source of arguments is the pre-move clear-out ,where couples disagree about what they want to keep and what they would like to ditch. But when you're haggling over the coffee table and going 12 rounds over your painting of dogs playing cards, it's worth remembering that things could be a whole lot worse - because there are plenty of people with far more unusual belongings around the house. 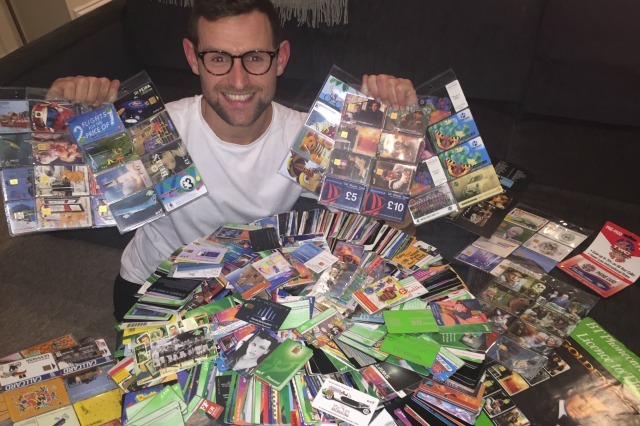 Sam McEwan, a 32-year-old from Brighton in Sussex has been collecting BT phone cards since he was nine years old, and now has over 1,000. He says: "They've become a bit of a bugbear for my fiancé Stella, who actually discovered my 'secret' collection purely by chance. She was looking in a wardrobe in our current home in Brighton when she found three large carrier bags, which were brimming with my phone cards. We'd been together for 13 years before my collection was revealed. It was a bit of a shock to her – she couldn't get her head around why I loved something which was seemingly useless to other people, particularly in the 'mobile' age." "My treasured phone cards have travelled from house to house with me – they've been with me for eight moves in total, from Chessington to Surbiton, Teddington, three homes in central London and then to Hove and now Brighton. It causes an argument every time we move! In fact, we're moving again soon and Stella has had a bit of a grumble about why we're paying removal men to move stuff which has never even been out of a bag, but I'd never get rid of them. After all, one man's trash is another man's treasure!" He adds: "My favourite series is the James Bond, Licence to Thrill collection. As a massive 007 fan, I was delighted when I found out they were being released and immediately snapped them all up. We now have this set on show in our lounge, which Stella isn't particularly pleased about, but now sees the funny side of." Phone cards used to be relatively common collectibles, and some fetched reasonable prices second-hand. However, prices have plummeted since the cards stopped being issued in 2002, and only exceptionally rare cards are likely to fetch more than 99p. It seems, therefore, that Sam and Stella are living with a collection worth around £1,000 - so he cannot even claim that one day the phone cards she put up with will keep them in retirement. 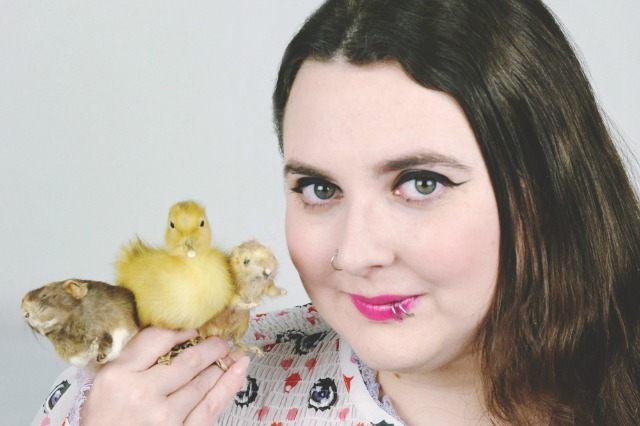 Beck Craggs, a 27-year-old from Hampshire, has an even more challenging collection - she is building up a collection of taxidermy animals. She says: "At the moment I have three animals - a rat (Ratty), a gerbil (Gerby) and a duckling (you guessed it, Ducky). I attended my first taxidermy class in February 2013 so I've only been collecting a couple of years. I'm definitely looking to expand it though. I'm particularly keen on finding a bat although I'm also planning to venture into skulls and wet specimens (those that are preserved in jars)." "I'm not entirely sure why I like collecting them, but I think of them as household pets. Ever since I was a little girl, I've been fascinated by death (in fact, I'm about to apply for a master's degree in death), so taxidermy is an extension of that. I find something touching in preserving animals after their death and maintaining the beauty that they had in life." She adds: "My husband was a bit dubious when I first mentioned going to the class (I booked tickets before I told him about it), he thought it would be a bit creepy and he still can't really understand the appeal. The rule is that they have to be small animals (so no moose heads!) that are kept safely under their display jars in the living room. He spends most of his time in his office so doesn't have to look at them too often." But what do you think? Are you putting up with your other half's belongings? And will you try to ditch them when you move? Let us know in the comments. The tenth most viewed property of the year on Zoopla, was this beauty in Penrith. It went on the market in August for just £100,000, and the low price and the opportunity for transformation drew in thousands of people looking for a potential project. This lovely home was the ninth most popular property of the view. Potential viewers were drawn by the opportunity to buy a five-bedroom detached property, complete with a garage and a drive, for just £187,950. The eighth most viewed property was another relatively new, detached property, with a garage. Seventh place is impressive for a property that only hit the market in November. The cheapest home in the top ten comes in at number 6. For just £40,000 you get three bedrooms and a garage in Liverpool. It's no wonder that so many people, who have been squeezed by soaring property prices, are keen to view a property that offers a glimpse of hope. In fifth place is the first of two mega-expensive homes on the list - and by far the most unusual. This one, in Newport, south Wales, hit the market in February for £1,899 950. The 1720s hunting lodge and tower had been transformed during an episode of Grand Designs in 2009 - by a couple who added a dramatic glass extension. Thousands of us couldn't resist having a look around. This swanky new-ish property in Gerrards Cross, Buckinghamshire, made number four, despite only going on the market in October. It ticks all the boxes that have put so many of these properties on the list - being detached, and offering five bedrooms plus a garage. The price reflects the fact it offers all that - in one of the priciest parts of the country. It makes it the most expensive property in the top ten. A detached property in Bradford, offering three bedrooms for just £149,950 made it to number three. It's perhaps unsurprising that it attracted so much interest, because it's one of the cheapest properties in the top ten, and the many thousands of viewers must have been astonished they could get so much family home for their money. The joint-second cheapest property on the list is the second most viewed property in the country. It benefited from the fact that it went on the market at the end of 2014, so had plenty of time to attract viewers. However, the appeal of a detached, 3-bedroom house for just £100,000 drew viewers in their thousands. The number one most viewed property in 2015 was this 6-bedroom farmhouse in County Durham. It demonstrates that we're a nation of dreamers, drawn by the affordable £175,000 price tag - as well as the huge potential of a six-bedroom farmhouse, outbuildings, almost eight acres of land and planning permission for a wind turbine. It's no wonder s many thousands of us popped online to dream of a cheaper and simpler life in the country.